I’ve been mulling over a theme for this blog, and really I’ve got nothing. Or maybe I have too much! I am an eclectic eater- a big fan of the adventurous, the different, but most of all the HOT. In my mind, there is no such thing as too much heat. And I don’t mean mild taco sauce hot. I don’t even mean the recipes with the chilies next to them at Chilies (hell with Chilies, by the way). I mean hot in the original sense, hot that’ll put hair on your chest and then blowtorch it off. Hot that would make almighty Vulcan back off his forge and take a breather. So it’s fitting that we make our return to the kitchen on a fiery-hot turkey taco recipe. You’ll be seeing a lot of variety over the coming pages (coffee, baking, roasts! ), but my recipe book like my heart always returns to Mexican. Some food for thought! I like to cut down my taco recipes, veggies swapped for meat. You probably get enough meat in your diet. If you’re like me, you don’t get enough vegetables. Tacos make a great vegetable delivery vehicle! The spices will infuse any veggies you add at the start, and then veggies you add late in the cooking process will retain their originally taste. Makes for a nice mixture of flavors and textures, and as an added bonus it’ll reduce your carbon footprint. So, I’ve thought it over, and I’ll be including a real, actual, measured recipe with each post from here on in. Don’t know what I was smoking for the first few recipes. For this particular dish, you want the total amount of vegetables to be roughly equal to the total amount of ground meat. That will ensure your lunch is not too terribly meat heavy. Al vulcán, in the pan! 1/2 green bell pepper, cut into strips. 1/2 poblano pepper, seeds removed under water and finely diced. 1 packet McCormick’s *HOT* taco seasoning mix. Prep- microwave 1/3 cup of water and dissolve spice mix within. 1: Pan fry your corn at high temperature in a large skillet with a light coating of canola oil. Careful, kernels will pop! Keep it on the heat until the kernels begin to brown. That will infuse the dish with color and a nice, carmelly underflavor. 2: Add meat. Allow to brown on the outside, and then break up into crumbles. 3: Add onions, which should have an opportunity to carmelize. 4: By this point, your turkey should be juuust shy of fully cooked. Add the finely diced poblano peppers and the chopped bell pepper strips. 5: Once the turkey is mostly cooked and the poblanos are integrated and cooking, throw in the spice infused water. 6: Look at it go! 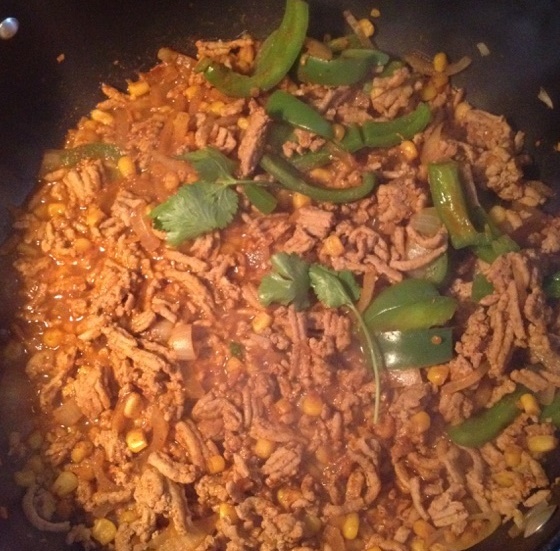 The spices will seep into your taco filling, and quickly boil down to the right consistency. Add a dash of citrus juice and cilantro as the final step, mixing thoroughly. It should be more like a jelly than like a soup- be sure to measure your water carefully! And there you go! Serve over corn tortillas with a side of totopos. You might be wondering- “A McCormick spice packet? Really? I thought this was a fancy blog for fancy food.” I’ve tested a handful of pre-prepped taco seasonings, and of course I’ve made not a few from scratch, and McCormick’s is top notch. The hot mix is particularly balanced, and truly, aggressively spicy! It makes a great taco, so I have no problem using it in a model recipe. A nice, spicy treat- I use these as lunch tacos. This mixture makes 24 small tacos, or 8 single person servings. The taco filling keeps in the fridge for seven days, so you can microwave it and use it for an easy meal throughout your work week.